I recently (this week) tried these 3 recipes and liked them all. First a delicious Banana Nutella Bread. Not too sweet, and I made this as muffins. It made 24 with a little batter left over (enough for about 1 more muffin). I baked these for about 25 minutes, I think. I did not take a photo. 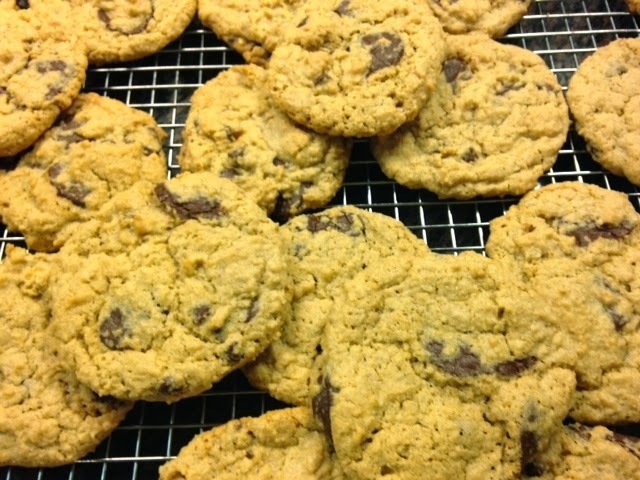 Next, some gluten free chocolate chip oatmeal cookies. This is my first experience with GF baking, and I used Cup 4 Cup gluten free flour (purchased at Whole Foods) and Trader Joe's gluten free oats. Cup 4 Cup does contain Xanthan gum, so no need to add it separately. These are delicious, gluten free or not! The only change I made was to grind the oatmeal in my food processor, as I do for my conventional oatmeal chocolate chip cookies. Here is a picture of my cookies. Recipe link is below the picture. Finally, I get a CSA box delivered to my home every Thursday by Good Life Organics. I also get a weekly email from them with details about the contents of that week's box as well as recipes and storage tips. Lately, a bunch of kale is included in the box almost every week, so I am always looking for interesting ways to use it. I have made delicious Kale Pesto several times using this recipe. This week's email included a recipe for a delicious kale salad. I made it last night, and will be adding it to my file of kale recipes-yum! I left out the raisins, but will add them next time. Dried cranberries might be good, too. Here is a photo of my salad, and the recipe is below. Happy cooking and baking! Once you try this, you will be hooked! If your family members aren't huge kale fans, this salad might convert them, and you can also lighten this up a bit by adding an equal part of chopped butter lettuce to the minced kale. Recipe and photo from foodbabe.com. Thank you Laura for sharing!